Snowflake Kitchen | Trying to find a way to live on jam and pickles alone. And probably putting them in a cocktail. Today was nothing short of glorious. I worked a 3/4 day, went to the dentist, took a short hike with my dog in 70° sun. Then proceeded to break out the motorcycle, take a 20 mile ride to Harry’s Place for a most excellent cheeseburger, and come home before it got too cold, because it’s still April after all. And we got home not a moment too soon, because my hands went numb by the end of the ride. The only possible cure was a finger of whiskey, which is conveniently seated a foot to my right. An excellent day indeed. And I’ve been quite lucky, because 2015 has been full of some pretty excellent days. Lately, its been surprise after surprise of new growth from bulbs and trees planted long before we got here. Yesterday, we found out we are the owners of a thundercloud plum tree (which apparently bears 1″ edible fruits that are a cross between a cherry and a plum and I AM SO STINKING EXCITED TO PUT THEM IN JARS). And I may be going out on a limb here, but I think we were pretty lucky to have the winter we had. As some of you might have noticed, February 2015 arrived on the scene bringing just a little bit of snow. Just a bit. Even though it was a helluva winter, in hindsight I can say the forced downtime wasn’t always a bad thing. It was certainly a good test of our resourcefulness, not to mention our roof rake. Plus, as ye olde enormous snowpack began to melt, cabin fever made me jump outside to begin the first project of the year: sugaring. There are a lot of great resources out there for how to get started sugaring. That said – there are a few things I plan on tweaking next year. Equipment: You really don’t need fancy stuff. I got this kit as a Christmas present and combined it with a few months worth of saved milk jugs and orange juice bottles, which worked wonderfully. I love the galvanized pails and hooks, but at $35 each, it was just not practical. Plus, by using collection/storage containers with lids, I could walk over to one tree, remove the bottle, add a new container, throw it in my backpack and walk to the next tree. Closed containers were an added bonus for storage in the fridge for a few days in between boiling sessions. Tap Height: I tapped my trees at whatever height, but made sure they were facing south. Well, genius, when the snow melts, if you are using DIY containers (like me), you need to tap such that your lines will still reach the bottles when they are resting on the ground, too. Obviously this is more of an issue in years like 2015 with enormous snowpack. Something to keep in mind. Containers: I used half gallon containers. Next year I might consider gallon sized ones, as some of my trees produced at least a half gallon per day at the height of the season. Most of the time I could empty them every day, but on the off chance I couldn’t it, would be a waste. Type of Tree: Next year, I plan on segregating and storing my sap by type of maple. This year, I mixed all my different sources in each batch, which made for some interesting woody flavors in my syrup. Not bad, just… interesting. I also should identify which kind of maple trees they are next year, as some of them are definitely not sugar maple. One looks suspiciously like a Norway maple. Oops. I plan to tap our hickory and black walnut trees next year too. Sap Storage: I am going to need another fridge next year, and will plug it in exclusively for sap storage. Unless I can find some way to store it outside when the temp is still below freezing. There is no way I have enough room to store sap AND food in one fridge without boiling at least every other night. Which is a process I don’t plan to repeat. On the bright side, boiling almost every night, then sticking the pot outside in the snowbank to cool was really effective. Boil Outside: You know how most sugarers boil in large metal pans outside? Yeah, there’s a reason for that. At least it will be easy to take down the wallpaper in our kitchen now? Removal: Oh yeah, when it’s all done… no one tells you this key piece of advice: take out your taps with pry end of a hammer. All said and done, it was fun to get eight pints of syrup for not a ton of work. Our stove really deserves most of the credit. I admittedly burned a few batches too, which I hope to not repeat. I think it’s safe to say that I’ve picked up a new habit. And for an even newer habit: the first package of bees gets delivered in a few weeks. Here’s to 2015 continuing on the glorious end of the spectrum. We moved house and home in September. Into not our first place, but the first one that’s ours, mortgage and all. The joys (and headaches) of being new homeowners have been simultaneously overwhelming and exhilarating. How it’s supposed to be, right? Moving stinks. Trust me, I get it. But I had a triple whammy of being a preserver, and burgeoning cocktail nut, during shoulder season. You can imagine the acres of delicate (and full!) glass we had to schlep. Like multiple carloads. Multiple MULTIPLE cardloads. Combined with forced down time during the height of the season. Now that it’s all said and done, the joy of sitting down and relaxing in our own space makes it all worth it, ten times over. Another joy has been Cathy’s wonderful book, which was delivered a few weeks ago. I got a chance to sit down under a warm blanket and digest it with a cup of tea. This book is far more than meets the eye, folks (even though that cover is sure a looker!). Its nothing short of an inspirational collection of preservation techniques and recipes of all colors and flavors, from entry-level to expert territory. I have already bookmarked the Blackberry Hazelnut Conserve for next year’s list (if I don’t sub the black raspberries in my chest freezer in the interim). As someone who has waterbath canning pretty down (or so I’d like to think), I am most excited about Mrs. W’s forays into other areas. I’ve been pouring over the smoking and curing sections, looking at Gravlax, Guanciale, Hot-Smoked Salmon, Smoked Whole Chicken, and Maple-Bourbon Bacon. Plus, in the index, there are SEVEN entries under bourbon alone. Mrs. W is singing my tune. I especially appreciate Cathy’s new twist on old favorites. Just in time for this month’s big holiday, her Whole-Cranberry Raspberry Sauce recipe strikes just that chord. New preservers? Fear not – you can make the recipe, put into a jar and refrigerate. Want to be able to put it on your shelf or give as gifts? Follow Mrs. W’s waterbath canning instructions (it’s super easy – if you have hot sauce you are 90% there!) Just follow the recipe below. 1. Combine the sugar, water, zest, and juice in your preserving pot and bring to a boil over high heat, stirring to dissolve the sugar. When the mixture is briskly boiling, carefully add the cranberries. The berries will burst when heated and may splatter. Cook until most of the berries have burst and the sauce is thickening, about 12 minutes. 2. Add the raspberries and bring back to a boil that will not stir down. Boil hard for about 10 more minutes. Test the set using the wrinkle test or the sheeting test. Add the butter, if using, to clarify and clear the sauce. rims of the jars well with a damp paper towel. Place the lids and rings on the jars and finger-tighten the rings. 4. Process in a boiling-water bath for 10 minutes. The sauce is shelf stable for 1 year. The preserve is great all by itself, but I, of course turned it into several libations. First, I added a spoonful to a can of raspberry-lime seltzer while I waited for the jars to process in the waterbath. Then, I added 3/4 of an ounce of Michter’s Toasted Barrel bourbon and some Hella Bitter Aromatic Bitters. Then, the next day, it was the perfect happy hour accompaniment with some Bombay Sapphire Far East, homemade Kaffir Lime bitters, and tonic. However you choose to use it, any cocktails made with Mrs. W’s Whole-Cranberry Raspberry Sauce are equally beautiful and delicious. Interested in a deeper look at Mrs. Wheelbarrow’s Practical Pantry? One lucky reader is going to take home a copy of this gorgeous book. Leave me a comment below, telling me what new-to-you preserve is first on your list for 2015. Then seek out some bonus entries. The giveaway ends on 11/10/14. Good luck! This entry was posted in bitters, cocktails, giveaways, preserving on November 3, 2014 by Kate @ Snowflake Kitchen. I had exactly a million and one ideas swirling about for my very first Mixology Monday. This month’s theme is The Smash. Of course, all those great ideas all went out the window (thanks procrastination, humidity and stress!) and I decided instead to make one with what was on the shelf and in the fridge in between massive canning projects. ‘Tis the season, after all. This version turned out quite nicely, as most smashes I usually make are firmly on the sweeter side of things. Which gets old. Quickly. As a preserver, I usually have fruit and syrup in excess at my disposal: in recent memory I’ve put up mulberry syrup, shiro plums in honey syrup, smoked cherry syrup, rhubarb in syrup, pickled blueberries, two kinds of cocktail cherries, and jams galore. This cocktail, as a nice change of pace, prefers instead to straddle the sweet-sour fence, with help from rosé and tart shiro plums. A nice change from your average smash, topped off with some funky, piney propolis bitters from Stonewall Apiary which take the drink over the top. I may make variations of a whatevers-in-season fruit smash a lot folks, but this riff is a keeper. Muddle pollen, plums and rye. Add rosé and rhubarb syrup, and stir well. Add crushed ice, and a few dashes of bitters. Top with a more creative plum garnish than what I can come up with. Cheers! This entry was posted in bitters, cocktails, infusions + syrups on July 28, 2014 by Kate @ Snowflake Kitchen. Don’t blink – in case you missed it, cherry season has come and just as quickly gone again as suddenly as it appeared. In the midst of buying a house and all the insanity that comes part and parcel with that big life step, I took a lovely break to go to Belltown Hill Orchards with friends. We completely binged on the first day of cherry season – picking eight pounds in about forty minutes, not counting the ones in our bellies. It was the perfect antidote to forget about it all. At least for a few hours. But the serenity found in the PYO orchard is not just preserver’s therapy. You see so many different types of people in the cherry orchard – families, couples, all generations – all out to get ’em while the getting’s good. True to form, the cherries were picked out the next day and gone for the rest of the year shortly thereafter. So what to do with the fleeting bounty of local cherries? I’ve made cocktail cherries before. Luxardo-ed to the max Maraschino Cherries and Cherries in Bourbon Meyer Vanilla Syrup. And I’ve discovered a few commandments cardinal rules of jarred cherries along the way. First, thou shalt stem and pit your cherries the same day you plan to can them. Second, unless you have specific plans for them, spike the syrup with a tablespoon or two of alcohol just prior to the waterbath instead of fruit in full-on spirit. This makes for a much more versatile preserve. Third, make more than you think you’ll use, because the syrup and cherries themselves are equally delicious. Here is this year’s version, which are already being enjoyed with seltzer and lime bitters, but equally anticipated in a black Manhattan someday soon. Add spices into a jelly bag or cheesecloth bundle. Make 1:2 simple syrup by bringing the sugar and water to a boil and add spices. Simmer on very low heat for about 5 minutes and infuse for as long as you can, up to overnight. When ready to can, prepare canner, jars and reheat syrup. Pit cherries and cold pack into hot jars. Pour one tablespoon each bourbon and creme de cassis over the cherries and top with syrup. Leave approximately 1/2″ headspace and process for 10 minutes. This entry was posted in cocktails, infusions + syrups, preserving on July 21, 2014 by Kate @ Snowflake Kitchen. Sorry, folks. I’ve clearly been elsewhere. Trying to live in the moment, however in vain that might be. We’ve also been sucked into a late and long spring that is now right on the edge of summer, and I just can’t help avoiding all things inside. On top of all that, we’re trying to buy our first house, having intensive dog training issues/classes, and generally trying to keep ourselves sane, washed and fed. Not much time for creative outlets, but when a rare moment reveals itself, I have been much less focused on putting things into jars. Lately, its been an obsession putting things into a glass. So I hope you don’t mind, but I think we are changing course on the blog a bit. I have dove deep into the world of craft cocktails – reading new books and blogs, binging on vintage glassware at the thrift store, and planning my next Drink Up NY and Caskers orders. I think many of my preserving skills transfer well to the world of cocktails, and – let’s face it – there was a lot of overlap anyway. So cheers to the new chapter – and thanks for sticking with me. 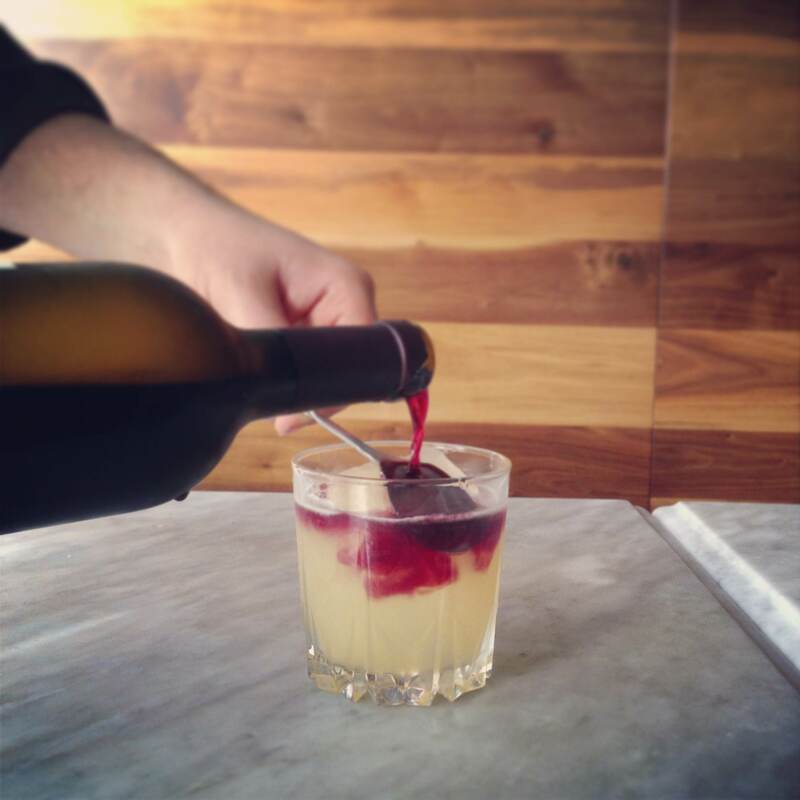 So a New York Sour is a classic twist on the whiskey sour – usually with a red wine float. This one subs in my favorite Grade B maple syrup for simple syrup – and gives the drink some richness you wouldn’t otherwise get with plain old cane sugar. Though this was made with Connecticut maple syrup, a Fairfield/Litchfield County sour didn’t have the same ring as a Champlain Sour (you know, the VT/NY border). If you’ll allow me a little geographic liberty, this drink is a nice departure from your average whiskey sour. Add rye, lemon, and maple syrup in a cocktail shaker. Add ice. Shake for approximately 15 seconds, until frothy. Strain into a short glass (Duralex obsessed over here!) and float the red wine (pour gently off the back of a spoon) on top. Cheers! This entry was posted in cocktails on June 13, 2014 by Kate @ Snowflake Kitchen. February is always the worst for me. It’s always when I hit my quota of tea and time spent under a blanket in a hoodie because I am too cheap to turn up the heat in this sieve of a house. I become awash in itchiness, not just physical but also mental – craving warmth, Vitamin D, and sunlight with every fiber of my being. It borders on obsessive, but it’s never usually too long before I can get some trickle of relief. Except this year. This year, a frigid February has bled all the way into late March. It seems we may get a brief thaw towards the end of this week. You know, the exact same story as the past three or four weeks. Today didn’t even crack freezing. Again. Sigh. Ahem. So. In an effort to relieve my intense seasonal itchiness, I’ve been reading, taking stock, and cleaning out my freezer stash like every other preserver on the planet. Plum & merlot preserves, raspberry rhubarb cardamom jam, rhubarb bitters all out of the freezer and onto the shelf. I am on a one-way stubborn driven mission to clean out all of the old fruit before I allow any new through the front door. Because spring will come at some point. Right? RIGHT? While much of the Great Freezer Cleanout of 2014 is putting up once frozen fruit, some of it is trying to use up the last dregs of pantry staples too. This soup is a great vehicle for exactly that. Leftover protein? Sure. Wilted carrots? Of course. Greens of all kinds? Yes. Add whatever and call it minestrone anyway – I won’t tell. Full disclosure: not one ounce of Italian genes here, so my blessing doesn’t mean much. Who cares? Soup is forgiving. Most minestrones start with some sort of pork rendered (sausage, bacon, pancetta) but I find that it doesn’t lend a whole lot here. So I generally leave it out. I sweat the beans, herbes salees, paprika, onion, carrots, chile and garlic in a few tablespoons of oil in the bottom of a dutch oven or other heavy bottomed pot. Saute for a few minutes, then stir in the tomato products. While you can use sundried tomatoes out of the jar, these ones were dehydrated in the height of tomato season. I like that they add a real depth of richness to the soup without more oil or vinegar. Deglaze with the wine, and then add chicken stock. Bring to a boil and add pasta – cook until al dente. Wilt in the greens just prior to serving. Serve with crusty bread, a drizzle of super green extra virgin olive oil and as much grated hard cheese as you like. Make this recipe one last time, and with any luck, you won’t want to make it again for six months or so. This entry was posted in recipes on March 24, 2014 by Kate @ Snowflake Kitchen. What a strange winter this is. Not one, but TWO polar vortices, sheets of rain, and finding myself grumpier than usual about it. Most winters, I can scurry between house and car and office and car and house and other than deliberate ski trips, stay cozy inside. This winter, however, I have to take the furry guy that takes up most of my Instagram feed out for at least thrice daily walks. Some days, it’s chilly but lovely – the perfect thing to clear your head. Other days (ahem, today) it’s all driving snow and wind and even a Swix hat, Xtra tufs and two base layers can’t keep out the chill. If I had a fireplace, I would make one of these after making a raging fire and stare off into nothingness for a while. Alas, as my personal fireplace is only in my head, I will have to settle from the internal warmth that comes from bourbon. Back on the bitters train, a Manhattan makes a great vehicle for tinkering. If you are a cherry fan, this one is definitely for you. Mash the thawed cherries and mix with the bittering herbs into the alcohol in half pint or other glass jar with a lid. Toast the spices over medium heat until fragrant, and swirl into the same mix. Top with the sweet annie and infuse for at least three weeks. Shake once daily and start tasting after three weeks or so. My batch was ready at four. The Sweet Annie really makes these bitters. It’s intensely herbal tasting, but also fragrant. Cherry bitters a lovely, but try to find some if you can. I am lucky to have Sub Edge Farm closeby, and they bring bunches to market in the fall. Desperate? Email me – maybe I’ll even share my stash. Mix the first three ingredients in a cocktail shaker, or mason jar. If there is no ginjinha to be found, sweet red vermouth will work. Also if you have no cherry bounce (shame on you and make it next year!) – double your bourbon. You could even add a spoonful of cherry jam. Shake – stir – as you see fit. Add ice if you feel like it – this is an easygoing cocktail. Strain into a glass of choice – I alternate between a fancy coupe glass and a plain old Duralex tumbler – and then add bitters. No garnish needed, but a brandied or chipotled cherry would do you just fine. Alas, all I had was a clementine peel. This entry was posted in bitters, cocktails on January 24, 2014 by Kate @ Snowflake Kitchen. Anyone still hungover from the holidays? I don’t mean in the traditional sense, but in the too much of EVERYTHING sense: food, drink, sugar… over-stimulation all over the place. It’s been a wonderful, joyous holiday season, but I’m feeling lethargic and tired and need to reign things in a little. Ok, a lot. I suspect, with you lot, that I am not alone. The problem is, it being winter and all – I still crave something warm and delicious and satisfying. Luckily, this recipe splits the best of both worlds. It comes together super quickly if you have crust ready to go in the freezer, and it not there are plenty of recipes for you to choose from. It can operate as a clean-out-the-fridge-and-pantry recipe too: half a chicken breast, sauteed veggies – just throw in the already cooked stuff towards the end. Add olive oil to a dutch oven and saute onion and garlic over medium heat. Add potatoes, carrots, peas and chicken stock and bring to a boil. Lower heat to a simmer, until potatoes and carrots are fork tender. Add peas, carrots, and swiss chard. One to two minutes later, add the flour. Much of the chicken stock should be reduced, but if not, add more flour until the veg is well-coated. Add in the milk/cream. Spoon the filling into oven-safe ramekins. Coat the rim of each ramekin with the egg wash, and top with a piece of rolled out dough. Cut each piece so that there is a bit of overlap for the ramekin. Top the dough with more egg wash and some coarse salt, and bake until golden brown. While not technically all the way in the “lighter” fare, this pot pie recipe can help you on your way to a happy and healthy new year. Here’s to all 2014 has to offer! This entry was posted in kitchen projects on December 29, 2013 by Kate @ Snowflake Kitchen. I have taken it upon myself in the last few years to make the cranberry accompaniment to our family’s Thanksgiving meal. We were never really a jellied stuff out of a can family, more the “fresh” stuff out of a plastic tub family. And then I got into preserving and found how incredibly easy cranberry preserves are to make – due in no small part to the fact that that most cran-based preserves are almost guaranteed to set (thanks to their high pectin content). Cranberries pair with a myriad of flavors. Pommes are still around this time of year in cold storage if you give your local orchards a call. As someone who stashes fruit away all season in the freezer, rhubarb, blueberries, plums, meyer lemons, raspberries… all could work in one form or another. And think of the fresh and dried spices: bay leaf, thyme, rosemary, cinnamon, cloves, cardamom, nutmeg, vanilla, chiles or peppercorns all would add different dimensions. Of course, I would be remiss if I didn’t refer you to the liquor cabinet: spiced rum, gin, fortified wines and my favorite bourbon each would bring out different notes. I always make two cranberry condiments – a more low-test version and a more complex (ahem – less traditional) one. Last year lead to a locally grown ginger, clementine and bourbon combo, which was entirely lovely. This year saw a smoked salt and pomegranate molasses version and we saw a bourbon clementine reprise. For almost certain future reference, I bookmarked Cupcake Rehab’s Rockin Moroccan Cranberry Sauce with Preserved Lemon (already scheming preserved citrus for next year’s cran! ), Kitchen Simplicity’s Cranberry Curd and Canal House’s Cranberry-Port Gelée. In fact, the more I think about it, shouldn’t we nominate cranberry preserves as the official gateway preserve? Most people start with strawberry jam – despite the heartache of getting the right set and the pressure of it being the first fruit of the growing season (excluding my beloved rhubarb of course) lead to all this unnecessary drama. Cranberries are easy to work with, the set is reliable, and the timing is great. Make a small batch for Thanksgiving and serve fresh, make a larger batch and waterbath can for holiday gifts and enjoy the fruits of your labor in the off-season to get comfortable before June hits. The best part, though – is the leftovers. Too much cranberry? I always make at least two pints and have some leftover. You could always make a cake. I don’t know about you – but all of my thoughts about baked goods right now are not pleasant. So I turned to something to temper all the sweet of late – mostarda. Great served alongside your poultry leftovers but also pork – which could be a nice change of pace from the fowl overload of the last week. Add all of your ingredients to a saucepan and cook over medium heat until fragrant. Turn heat to low and cook until desired consistency. Pour into a glass jar with a lid (mason or locking) and refrigerate. * Serve alongside poultry, pork – or even a cheese plate if your holidays haven’t quite tapered off yet. *While this recipe is in all likelihood safe for waterbath canning, it greatly depends on the cranberry product you start with. If it was a relish or chutney (possibly containing low-acid ingredients like onion or garlic), I would keep this a fridge recipe. If it was homemade and had generally low-acid or pH neutral ingredients – go for it! I would process at 15 minutes. This entry was posted in preserving on December 4, 2013 by Kate @ Snowflake Kitchen.